AIM Password Recovery 1.8 Released! Hey all! 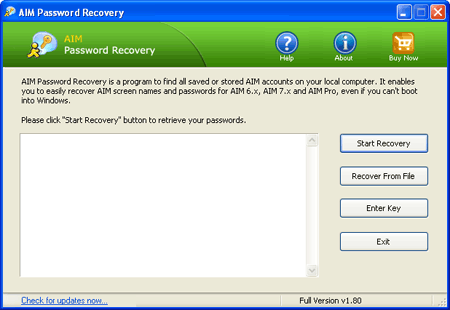 We are glad to inform you that AIM Password Recovery 1.8 is released. Moreover this update is absolutely FREE for all registered users! So, what about new features added? We’ve added the function of decrypting and recovering passwords for AIM 7, including the latest version AIM 7.5.11.9. Starting from AIM 7.0 the messenger has changed the encryption algorithm and doesn’t stored the passwords in Windows registry any longer. With the new version of AIM Password Recovery utility, you don’t need to care about where and how the AOL Instant Messenger 7.x stored the passwords. Just launch AIM Password Recovery program, click the Start Recovery button, the program will automatically find the encoded AIM passwords stored on the local computer, then decrypt and recover your logins and passwords right away!